1. Two small Aloha red and black script on the rails at sweet spot. 2. Two small Aloha red and black script on the rails at mid point. Grip :1. early model Gorrilla Grip Dial Patch yellow/red on tail.Image below. Grip 2.Gorrilla Grip Hand Grips (2) on rail at sweet spot, yellow. HISTORY: Donated by John McInnes in 1993 - original condition. An early copy of Simon Anderson's thruster design, featuring wide tail, no-nose and the then common channels. The texture deck is unusual. 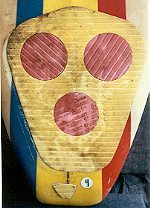 The Gorilla Grip Dial-Pad was their first major product and the 'Dial' feature - the three circles were cut out and the customer could offset the grid pattern - significantly differentiated it from the market pioneer, Astro Deck. The hand grips are rare. 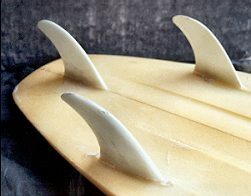 Aloha Surfboards started at the above address in 1979 by Greg Clough, who had previously managed Connexion Surfboards, Caloundra Queensland 1969 and worked at Midget Farrelly Surfboards. Aloha Surfboards/Greg Clough were given international exposure by professional success of Barton Lynch (1988 World Professional Champion), Damien Hardman and Pam Burridge. Pages 13 - 22 (Barton Lynch), 23 - 31 (Damien Hardman) and 77 - 79 ( Pam Burridge).